Alright, so you did something you are not so proud of. Let’s be clear, we’re not talking about major screw ups- like anything that meets criteria for abuse or neglect- we’re talking the overly harsh words or failure to understand the depths of need of our child if they have been trying to tell us about a problem. You know, the things we routinely beat ourselves up for as parents. First of all, I want to say (I may have said this before and I will probably say it again because it is such a wonderful statistic) that being “good enough” to support a securely attached child means we meet their needs a mere 30-40% of the time. This is not meant to give permission not to meet your child’s needs, but serves more to allow us to forgive ourselves when we miss something or respond differently than we would have liked and to see some of the positives in otherwise difficult situations such as divorce, death of a loved one, illness, trouble at school or with friends. Parental reframes work in all kinds of situations. What do I mean by parental reframe? Well, you know how you can take the same picture and put it in different frames to make it look different? Depending on the frame a picture is in, you may notice more of one thing or another. Life can be the same way. A large part of parenting, as I see it, is to help children (and ourselves) find the most appropriate, helpful frame to put our issues in. Notice, I did not say it was to shield children from all difficult situations. First of all, that is impossible and we would only be setting ourselves up for failure. Secondly, you would not want to do that since childhood is precisely the time we need to learn to handle difficulties while we have our parents to protect and guide us. We are there to help children frame the pain they will inevitably have- not to keep them from any pain. So, what is a parental reframe? It is taking a step back to look at the frame we have put around a situation, then asking ourselves if there may be another frame that we might like to use instead. There really are so few absolutes in life and really our reality can be framed in many different ways. Do you see the baby? If you are like me, it will take a minute for you to find it but once you do, you will see the baby was there all along. The toes are in the branches on the right, the head is made where the trees come together on the left. Once you see it, you can’t un-see it, even though it was there all along. That’s how a reframe is. We get stuck on a story: divorce ruins children for example, or maybe even a worry more universal to parents like the feeling that our child never helps around the house. These times are precisely the times when we need a reframe. How in the world are you supposed to reframe issues, especially beliefs or worries about your child that feel deeply entrenched? Let’s start the easy way first. When you have a few minutes, stop and take a few breaths while you pause to see if you can think about this issue in another way. It can be easier to do this if you ask yourself what your most loving friend might say about this issue to you. Ask yourself if it is possible that there may be alternative possibilities from what you have come up with so far. If you think it would be helpful, take a moment to brainstorm other possibilities for the belief you are clinging to. After all, this is only a belief and there are very few absolute truths out there. Let’s take our example of kids that don’t help around the house. Is it possible they try to help in some ways, just not the ways you wish they would? Is it possible they need more instruction to help? Is it possible you are asking (or demanding) for help in ways that are not effective for your children? Do they have something going on that prevents them from focusing on helping you like their age, ability level, extra-curricular activities, schoolwork, etc? Next, take a moment to consider what you would like to believe about your child. Create an affirmation about what you would like to believe. 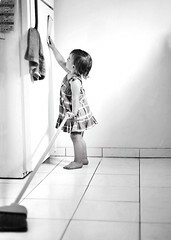 My child is helpful around the house in many ways. Think of ways this affirmation is true. Say the affirmation many times over the next few days. Point out when you child does helpful things and begin stating ways they can help you as if you expect them to do those things. Be surprised when they haven’t picked up their items off the dining room table! Just changing our attitude about a situation can help our children to change theirs. I have seen this work too many times to think otherwise. I have many clients with attachment disorders. Many times when they first come to see me their parents lament about how they are constantly in trouble. Their parents, who usually adopted them at an older age, often adopted them with the desire to show them how wonderful life can be! These parents want their children to have new and exciting life opportunities and they come in so frustrated that their children continue to get into trouble that requires the parents to keep them home more over and over. We reframe the statement of “my child is constantly getting into trouble and can’t ever make good decisions” to “my child gets easily overwhelmed by new experiences and transitions.” When we re-frame the child’s acting out behaviors from “bad” to “overwhelmed” the feeling as a parent changes significantly as well from a hopeless stance, to protective. While the child may still not be allowed out to do much, the intent and feelings behind the parents decisions feel more loving and come across that way to the children. I know this may all sound a bit Pollyannaish to people. Additionally, I do not want to say that a reframe on cleaning is the same as a reframe on divorce. However, there are helpful aspects to all experiences in life. If the technique of thinking it through is not working for you, please take a moment to read my previous blog “How to know if you or your child need a counselor” (link below). Reframes are a lot of what we therapists help people to do. Having trouble with a reframe? Let me invite you to post the belief you need reframed, or a belief you have reframed and tell me how it worked. While I can not diagnose or treat via a blog, I would love to have feedback on this topic (or any others). About 15 years ago I went to a talk given by Joan Borysenko. During her talk, she said she was quoting from someone whose name she could not remember- I’ve tried to look it up since but I can’t figure out who said it either. What she said is that there are four rules for life: 1. Show up, 2. Pay attention, 3. Give what you have to give, 4. Don’t be connected to the results. I heard these words when I was still in college, before I became a therapist and a mother and they have resonated with me ever since, especially as a parent. I believe that if we all incorporate some of the wisdom of these words into our daily lives as parents then we will all be happier, and we will have happier children. 1. Show up. Turn off your cell phone and the television. If you can ever volunteer at school, do it- even if it is only one time a year. Be present with your child in the moment as much as possible. 2. Pay attention. Pay attention to what your child is trying to tell you. Is your child asking you to read a book or watch a television show they really liked? Maybe there is something in the book they really want to discuss with you. Is your child telling you something about himself or herself that you have not been willing to hear? Notice, this step does not say, “Pay attention and judge.” or “Pay attention and fix what you think is wrong.” It says “Pay attention.” Meditation is a good tool to help us(and our children) learn to be in the present moment. 3. Give what you have to give. Another way I think of this rule is “set boundaries.” Again, notice it does not say “give of yourself until there is nothing left.” I think we as parents can sometimes have a hard time with deciding what it is we have to give, whether it be money, time or attention to our children. To me, giving what I have to give means giving something freely to my children or someone else so long as I will not feel resentful or remourseful later that I gave it. This is a hard one but so important to model for our children. 4. Don’t be connected to the results. I would add that you cannot control them anyway and it is time for us all to stop pretending that we do. Sorry folks, but in parenting there are so many aspects of a child’s life that are so far out of our control that we never had a chance anyway. Oh sure we can pretend things are all our fault when they go right or wrong, but any parent with a child that was traumatized, or who grows up to be addicted to something will tell you that was never in their plan for their child. Sure you can monitor what your child is doing but do they ever get into a vehicle with you or someone else? Do you have a television, radio or computer in your home? Well, if you answered yes to any of these, you no longer control the results. Accidents happen, good people can be hurt, children can conduct secret lives right under our noses with no small thanks to technology. We can have the best of intentions and still things can go wrong. Depressed yet? Please allow me to help with that. There are some things we can control. We can control our own actions. We can become aware of the ways in which we interact with our children and with others around us. We can be a safe, loving, soft place to fall for our children. We can model health and wellness for them in such a way that it would be difficult for them to ignore how wonderful it looks so they will be attracted to doing the same for themselves. Adding a spiritual practice is a good idea also if you believe in that kind of thing. A spiritual practice reminds us that our relationship with our children is just one important relationship and their relationship to their higher power is another (and is none of our business). Doing all of those things brings us right back to the first four steps I mentioned and allows us to live them with grace and dignity for ourselves and for our children.